This winter alone, I have had more athletes miss weeks of training due to a respiratory infection or flu than in my previous 18 years of coaching. It has been a doozy of a flu season so far. The fact is, hard training will suppress your immune system, leaving you susceptible to opportunistic infections. Getting sick and missing two weeks of training due to an illness is a real setback for any athlete. Endurance athletes need strategies to prevent illness as well as manage illness when they are unlucky enough to get sick. They also need comeback strategies to segue successfully back into training without a relapse. Unless you live in a bubble, you will to be exposed to infections. Minimizing the risk of contracting them is the name of the game. 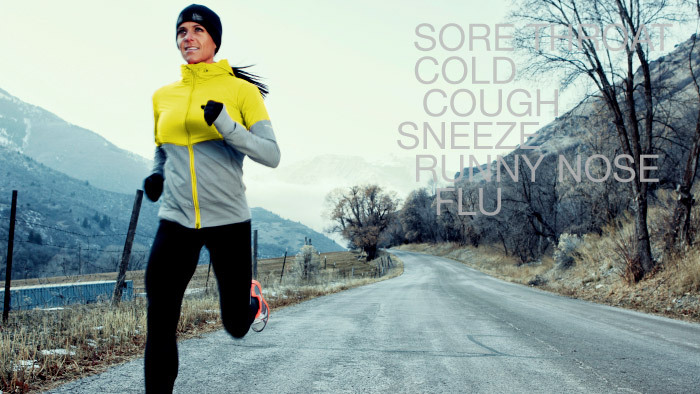 Hard training sessions suppress your immune system for a period of 3 to 72 hours. This period of impaired immunity is known as the “open window.” Being hyper-vigilant with prevention techniques during this “open window” period is advised. In other words, avoid going to big department stores or babysitting your runny-nosed nieces after a long hard ride. Execute all your recovery tasks post-training to minimize exercise-induced immune suppression. Maintain optimal nutrition to enhance general health and maintain vitamin and mineral stores, particularly Vitamin D status. Avoid crash diets and rapid weight loss. Avoid over-training and chronic fatigue with a careful, progressive training plan. Minimize contact with sick people, especially during your “open window”. Minimize time spent in public places with large crowds, especially during your “open window”. Keep a distance from people coughing and sneezing. If possible, ask them to wear a mask. Wash your hands before eating or after contact with sick people, public places and bathrooms. Carry hand sanitizer to use when hand washing is inconvenient. Avoid touching your mouth, nose and eyes with your hands. Use clean, disposable tissues to wipe your mouth or blow your nose, and put soiled tissues in the trash immediately. Do not share food or drink with anybody, especially cute children with runny noses! Use a face mask to protect your respiratory membranes from being directly exposed to very cold and dry air during strenuous exercise. Wear appropriate clothing to avoid getting overly cold and wet. Consistently get at least seven hours of sleep per night. Keep life stress to a minimum. Follow immunonutritional support guidelines (see below) to minimize training-induced immune suppression, and to bolster immunity. Several nutritional supplements and strategies have been shown to bolster immunity. Bonking during training is bad news for your immune system. Ensuring adequate carbohydrate fueling during and after heavy or prolonged exertion helps dampen immune inflammatory responses and counteract exercise-induced immune dysfunction. In short, carb up to stay resilient. Quercetin supplementation of 1,000 mg/day reduces illness rates in exercise-stressed athletes. Combining quercetin supplementation with green tea extract and fish oil can further augment immune function and reduce the incidence of upper respiratory tract infections in athletes. Lactobacillus probiotics can augment some aspects of immune function and reduce illness rates in exercise-stressed athletes. The bugs are out there and, despite your best prevention efforts, you may still fall sick. Most endurance athletes are tough as nails and would rather train through almost any illness than rest and get off-plan. That is a bad idea! Training through a viral infection can have serious negative outcomes, including mononucleosis, pneumonia, or myocarditis, an infection of the heart caused by common cold viruses. It is better to back off for a few days rather than blow up your common cold into one of these serious conditions. Remind yourself that you can’t build fitness on a sick body. Just how sick do you have to be before holding off on training becomes the correct decision? Any illness symptoms are reason enough to avoid training hard. I am okay with my clients completing a recovery-paced training session, keeping heart rate in zone 1, if all symptoms are above the neck. These include a mild sore throat, stuffy nose and headaches. Light exercise may be helpful in this instance. Stop training and take a day off from all activity other than gentle stretching if you have any below-the-neck symptoms. These include a very sore throat, fever, fluid in your lungs, coughing, body chills and aches, exhaustion, diarrhea or vomiting. While you are sick, rest, drink plenty of hot fluids, and seek comfort from over-the-counter cold remedies. The vast majority of colds derive from a virus, so taking antibiotics is rarely helpful. Antibiotics will weaken your immune system further by destroying bacteria—both good and bad—in your gut, where a portion of your immune system resides. If your illness symptoms deteriorate rapidly or continue for more than three days, consult your physician. Wait one day after below-the-neck symptoms have resolved before resuming any training. After that, resume training with a day consisting of one recovery-paced session. Continue training at a recovery pace until all above-the-neck symptoms disappear. Stop training and return to rest if any below-the-neck symptoms return. If you were sick for three days or less, resume your training plan after your one “wait day” plus one recovery day. If you were sick for more than three days, resume training with one “wait day” and two or more recovery days. After two or more successful recovery days, gradually ramp up your duration first, then intensity, to full training loads over the course of four to seven days. Use a face mask to protect respiratory mucous membranes if exercising in very cold temperatures following a respiratory infection. So there you have it. Avoid the bugs at all costs, rest when you do get sick, and come back to full training gradually. It all sounds like the stuff your mom told you to do when you were eight years old, right?